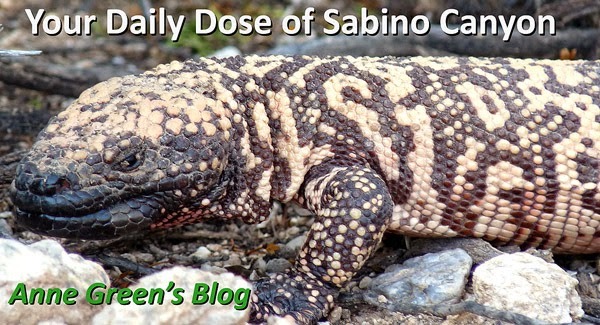 Your Daily Dose of Sabino Canyon: It's all Greek to me! It's so great to do this blog! (I wish I could devote more time to it.) Readers share their stories, answer questions, make corrections. What a nice community! Linda and I were sitting on a rock off trail about 2 miles up the phone line trail a few weeks after the Aspen Fire (2003). Suddenly a grey fox went past us at close range. We got up to try to see it again and we saw what we think was a second fox a little further off trail. The hair on "both" animals seemed singed and we speculated that when the fire spread to the lower elevations they had been caught up in it and were fleeing the area. Although the trail was fairly quiet, it was mid-morning and it seemed extremely surprising that they would be heading south on the Phoneline trail. Phainopepla is based on two Greek words: phainos (shining) and peplos (robe). Our Webster's Third International Dictionary, p. 1692 defines it as "as monotype genus of passerine birds of Mexico and the southwestern U.S. of which the male is uniform glossy blue-black with a white spot on each primary." My classical Greek dictionary confirms the two root words. The pyrrho part is 'red'. The loxia refers to a genus of crossbill. Pyrrhuloxia refers to a genus of finches related to cardinals. Both roots have Greek origins but also appear in Latin. The best I can do. And, because we're feeling all warm and learned, two short videos. And Neil deGrasse Tyson is always worth watching.